Thirty years ago this month I did an experiment that set the course of my career, and provided an important step forward for animal virology. I showed that a cloned DNA copy of the poliovirus RNA genome is infectious in mammalian cells. When I arrived as a postdoctoral fellow in the laboratory of David Baltimore in 1979, the restrictions placed on cloning complete genomes from pathogenic viruses in bacterial plasmid vectors had just been lifted. Consequently David suggested that I construct a full-length DNA copy of the poliovirus RNA genome, decode the genetic information, and determine if the DNA is infectious. By the fall of 1980 I had produced three different plasmids which contained overlapping DNA copies of poliovirus RNA. For most of the next year I worked on deciphering the complete 7,440-nucleotide sequence of the poliovirus genome. The methods I used – archaic by today’s standards – are worthy of a separate story. With the viral genome sequence completed, I turned to joining the three plasmids to produce a single DNA copy of poliovirus RNA. I began this task early in 1981 but success eluded me for most of the first half of the year. In the summer I attended a Gordon Research Conference in New Hampshire, during which I presented the poliovirus genome sequence (together with Bert Semler, who had worked on the genome sequence while a postdoctoral fellow in the Wimmer laboratory). The poliovirus sequence was enthusiastically received, and I returned from the June meeting rejuvenated. By July I had assembled a full-length copy of poliovirus DNA in a bacterial plasmid. 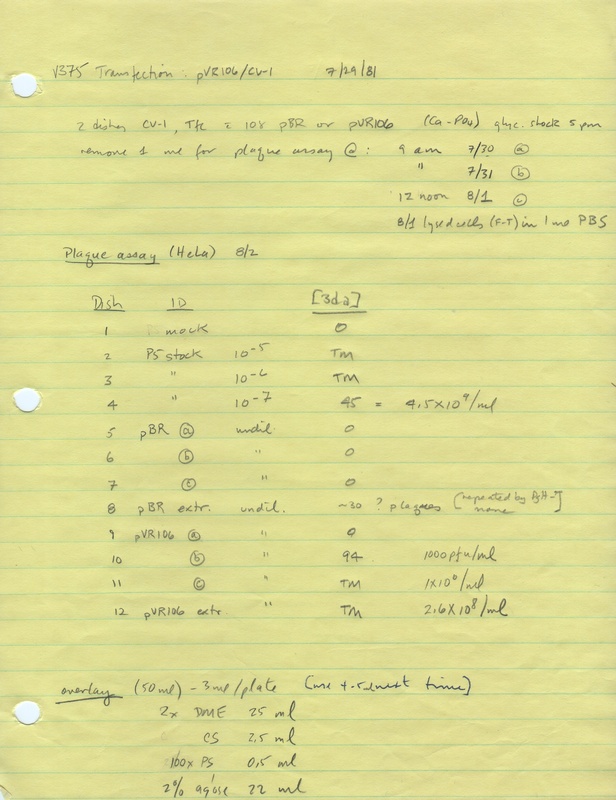 I called it pVR106, the sixth plasmid I had constructed while in the Baltimore lab. In early July I attended a lab party at the Baltimore summer home in Woods Hole, MA. There I told David that I had assembled a full-length DNA copy of poliovirus RNA. The next task was to determine if this DNA was infectious. The logic for this experiment is shown in the figure. 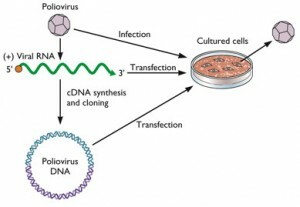 Poliovirus can initiate infection of cultured cells; poliovirus RNA, extracted from the virion, is also infectious when introduced into such cells by transfection. What would happen if we transfected pVR106 into cells? I asked David if I should first add a promoter sequence to pVR106, to allow synthesis of viral RNA from a DNA template. I remember his words clearly: “Don’t bother. Just transfect the plasmid into cells”. Then he went off to eat lobster. The next week I sought help from Richard Mulligan, a postdoc in Phil Sharp’s lab and an expert at introducing DNA into cells. He set up two plates of CV-1 cells (African green monkey kidney cells, known to be susceptible to poliovirus) which we used in a transfection experiment done on 29 July 1981. The protocol for the experiment (jpg file) shows that we transfected one plate of cells with 10 micrograms of the plasmid vector, pBR322, and one plate with the same amount of pVR106. Immediately after transfection I removed 1 ml of the medium for virus titration. I also saved 1 ml of medium on each of the next two mornings, and on the third day broke open the cells in a small volume of buffer to determine if there were virus particles inside of the cells. To determine if virus had been produced by DNA transfection, I did a plaque assay on the culture samples using monolayers of HeLa cells. The positive control for the plaque assay was poliovirus – which gave beautiful plaques (dish #4). No plaques were observed when cell culture medium from the zero time point of cells transfected with pVR106 was used; however infectivity was observed on days 1 and 2. Unfortunately, the negative transfection control was problematic – there were plaques in the lysate of cells transfected with the vector pBR322 (dish #8). I suspected that this sample had been contaminated with virus from one of the other samples, but I could not pinpoint the source. Just before I began this experiment, David left for a meeting in Europe – the widely attended International Congress of Virology. He had left instructions to call him if the experiment worked. I wasn’t sure if I should tell him yet, having observed plaques on the negative control. So I showed the results to Bob Weinberg – his lab was on the same floor and I often asked him for advice. He looked at the plaques and told me the experiment looked great – pVR106 was most likely infectious. But he told me not to tell David until I had repeated the experiment. “If you tell David, the world will find out”, he said, and that should not happen until the results were confirmed. So I didn’t call David, and I repeated the experiment on 12 August 1981. This time the results were very clear: cells transfected with pVR106 produced poliovirus, and cells transfected with the vector pBR322 did not. When David returned from Europe, I went to tell him, but Weinberg had reached him first. “Be a hero”, David said to me. To this day we do not understand why cloned poliovirus DNA is infectious. The most likely explanation is that the plasmid vector contains a sequence that acts as a promoter for RNA synthesis – what we call a cryptic promoter. Some years later Bert Semler inserted a promoter sequence upstream of poliovirus DNA, and found that this DNA is more infectious than pVR106. Since this work, infectious DNA clones have been produced for many other DNA and RNA viruses. These reagents are double-edged swords: they enable manipulation of the viral genome at will, allowing unprecedented genetic analysis and the use of viruses as vectors for gene therapy. But nearly any virus can now be recovered from the nucleotide sequence – effectively making it impossible to ever truly eradicate a virus from the globe. I was very lucky to be in the right place at the right time to accomplish this work. It opened doors for me: without an infectious poliovirus DNA clone, I would likely not have obtained a position at Columbia University, where I have been fortunate to work with many talented students, postdoctoral fellows, and technicians who have accomplished outstanding work. One of those students was Eric Moss, who I thank for reminding me of what transpired 30 years ago. from someone who is attempting to generate a full-length mumps virus clone as we speak, I want to thank you for this. Thank you very much for your personal research experiences. As you said the right place and the right time were very important, but the right research field and personal hard work were very important, also. In the research fields, actively cogitation , darely attempt, good writing techniques and research team were important elements too. thank you again. Very interesting insights, thanks. With regard to the cryptic promoter(s), some have indeed been described, see Fig. 5 in Langner KD, Weyer U, Doerfler W. Proc Natl Acad Sci U S A. 1986 Mar;83(6):1598-1602. The promoter is prokaryotic, even leaving the possibility that there was already RNA in your plasmid prep that could have started the rescue (unless you treated your prep with RNase of course). Thanks for the fascinating story. It is refreshing for those of us working in scientific research for uncountable hours without getting to find anything “valuable” hoping that the light will shine one day. In the original Science paper in which these results were reported, we included an experiment in which we treated pVR106 with RNAse, and then transfected the plasmid into cells. The infectivity was no different when compared with untreated pVR106, suggesting that RNA produced in bacteria initiated the infection in mammalian cells. I should also have included hard work as part of the recipe for success. I did work very hard as a postdoc. Hard work is necessary but not sufficient for success in science. Many thanks for your answer. However, if RNase treatment didn’t make a difference does that not indicate that the rescue was initiated only after transfection of pVR106 and transcription in the HeLa cells? Or do I miss something? Thanks for your reply! All the reviews was written after reading your story and with myself guess. I have seen your lab and research work, your work is very interesting at least in my opinion. Isincerely hope you can give me some help in my study in the future. As other commenters – thanks for this post. I love this kind of “How the West was won” story. And you did all this without the benefit of Qiagen columns or automatic sequencing! Lots of hard work indeed. Truely inspiring especially I will be doing the same, making an infectious cDNA clone. Thankyou for sharing this. I think now I can go ahead with my work with more confidence than I had before reading your blog. It’s good to hear that my stories about ‘ancient virology’ are welcome.